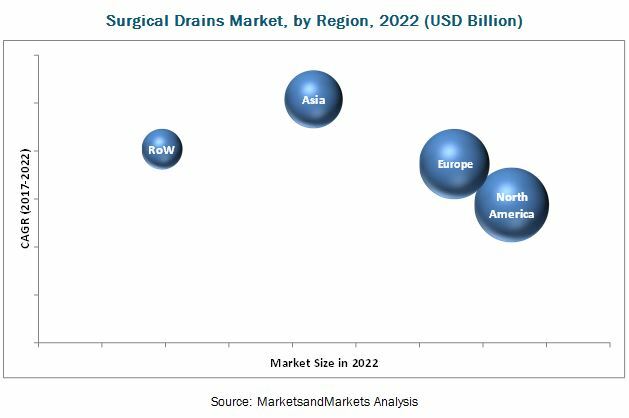 [140 Pages Report] The surgical drains market is expected to reach USD 2.18 Billion by 2022 from USD 1.78 Billion in 2016, growing at a CAGR of 3.7% during the forecast period. The base year considered for the study is 2016 and the forecast period is from 2017 to 2022. The study estimates the surgical drains market size for 2017 and projects its demand till 2022. In the primary research process, various sources from both demand side and supply side were interviewed to obtain qualitative and quantitative information for the report. Primary sources from the demand side include various industry CEOs, vice presidents, marketing directors, technology and innovation directors, and related key executives from the various players in the wound drainage market. 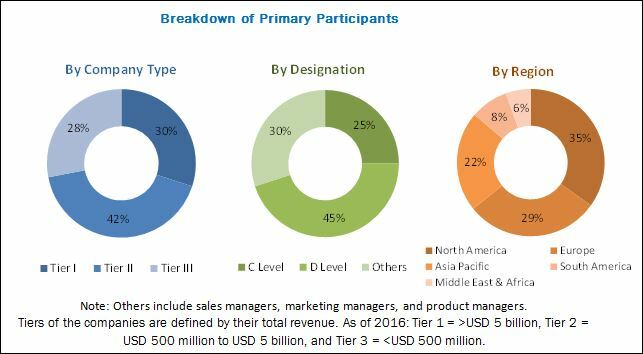 For the market estimation process, both top-down and bottom-up approaches were used to estimate and validate the market size of the global as well as to estimate the market size of various other dependent submarkets. All possible parameters that affect the market covered in this research study have been accounted for, viewed in extensive detail, verified through primary research, and analyzed to get the final quantitative and qualitative data. This data was consolidated and added to detailed inputs and analysis from MarketsandMarkets and presented in this report. Secondary sources such as Association for the Advancement of Wound Care, European Surgical Association, American Professional Wound Care Association, and Japan Society of Surgical Wound Care were referred. The surgical drains market is highly competitive with the presence various players. Some of the major players operating in the market are B. Braun (Germany), Cardinal Health (US), ConvaTec (UK), C.R. Bard (US), Redax (Italy), Ethicon (US), Stryker (US), Romsons (India), Medtronic (Ireland), Medline Industries (US), Cook Medical (US), Poly Medicure (India), Zimmer Biomet (Indiana), Global Medikit (India), and Degania Silicone (Israel). The surgical drains market is expected to reach USD 2.18 Billion by 2022 from USD 1.82 Billion in 2017, growing at a CAGR of 3.7%. The growth of this market is mainly driven by the growing geriatric population, increasing number of surgical procedures, and rising awareness programs globally. This report segments the wound drainage market into product, type, application, end user, and region. Based on product, the market is segmented into accessories and surgical drainage systems. The surgical drainage systems segment is expected grow at the highest CAGR during the forecast period. The high growth in this segment is attributed to the growing volume of high-risk surgical procedures and the benefits associated with surgical drainage systems, such as accurate measurement of drainage, lowering bacterial levels, and effective in closing wound edges. Based on application, the surgical drains market is segmented into general surgery, cardiac and thoracic surgery, orthopedic surgery, obstetrics/gynecology surgery, and other surgeries. The cardiac and thoracic surgery segment is expected to register the highest CAGR during the forecast period. In 2017, North America is expected to dominate the market, followed by Europe. The increasing incidence of chronic wounds and surgical site infections, growing number of surgical procedures, rising geriatric population, and higher adoption & awareness of advanced surgical & wound care products are the key factors driving the growth of the surgical drains market in North America. Asia is expected to grow at the highest CAGR during the forecast period. The high demand for advanced wound care products in several Asian countries, rising geriatric population, increasing number of surgical procedures, rising prevalence of chronic as well as diabetic wounds, and focus of major players on enhancing their presence in this region are some of the key factors driving the growth of the surgical drains market in Asia. The risks associated with the use of surgical drains may limit market growth to a certain extent in the coming years. The wound drainage market is highly competitive with several big and small players. Prominent players in the global market include B. Braun (Germany), Cardinal Health (US), ConvaTec (UK), C.R. Bard (US), Redax (Italy), Ethicon (US), Stryker (US), Romsons (India), Medtronic (Ireland), Medline Industries (US), Cook Medical (US), Poly Medicure (India), Zimmer Biomet (US), Global Medikit (India), and Degania Silicone (Israel).